Our guests have caught 141 Muskies at Indian Trail Resort in 2018. Nathan McKeeth won the 2018 “Angler’s Way Trophy” for the longest musky caught by a guest of Indian Trail resort, a 50 inch musky. 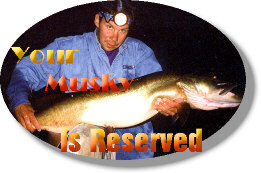 Leah Huckthausen caught the largest musky by a youth and a woman guest in 2018, a 40 ½ inch musky. In 2018, our guests caught 141 muskies (100% of which were released) that totaled 5612.125 inches in length and averaged 40 inches. Out of our resort in 2018, 80 muskies over 40 inches were caught; 56 of which were over 20 pounds and four of which were over 30 pounds.